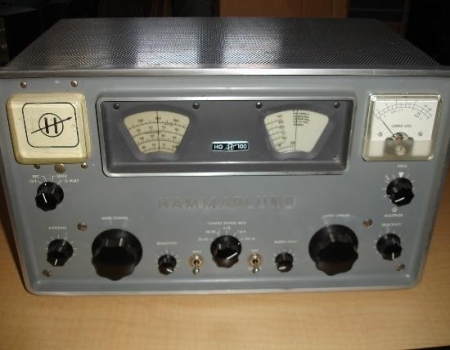 The Hammarlund HQ-100 is a Single Conversion Superheterodyne receiver with 10 tubes covering 540 - 30000 kHz. 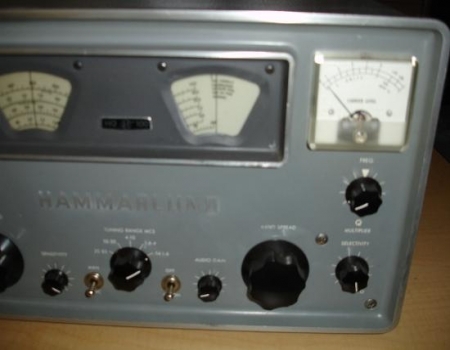 The receiving modes are AM and CW/SSB. The controls are as follows, starting at the upper left a On/Off - Receive - Send - Q multiplier switch, Antenna trimmer, Main Tuning, Sensitivity, AVC(Automatic Volume Control), Band Selector, Noise Limiter, Audio gain, Band spread, Selectivity, Q-Multiplier control. 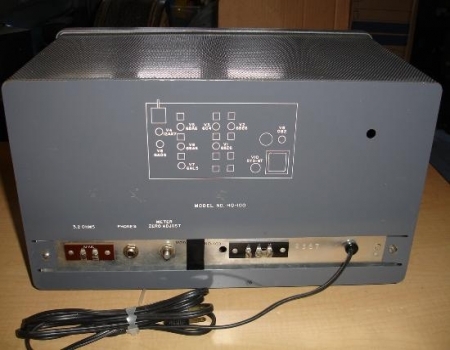 The tubes and their functions are as follows, 6BZ6 = RF Amplifier, 6BE6 = Mixer, 6C4 = HF Oscillator, 6BA6 = 1st IF Amplifier, 6BA6 = 2nd IF Amplifier, 6AL5 = Detector/Noise Limiter, 12AX7 = 1st AF Amplifier/Q-Multiplier/BFO, 6AQ5 = Audio Out, 0B2 = Regulator and a 5Y3 = Rectifier. This receiver weighs in at 30 pounds. 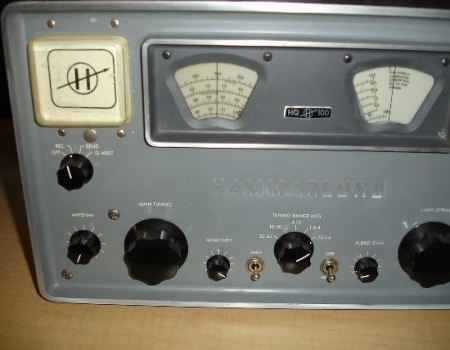 The XC-455 option kit adds a 455 kHz crystal controlled BFO(Beat Frequency Oscillator) to the second detector which permits CW reception with a variable bandwidth of 100 to 3000 kHz..